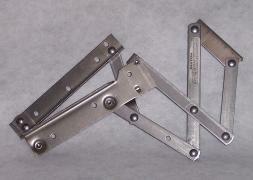 This hinge is used in the child’s recliner and also what they call the baby recliner. This product can be picked up by the set or we have them boxed and ready to ship. > Pickup by the set. The Juvenile Recliner Hinge started off as the bread and butter for Col-Eve Metal. As one of only a few producers of this item in the United States this product has seen several redesigns to become what it is today. We use 12 Gauge (.110) material for all the bars on this hinge and 16 Gauge (1/16”) material on all plates. It is a very durable hinge for its use. If you have any questions about this product please feel free to give us a call at 336-472-7039.